I soaked some almonds last night to make almond milk this morning. However, I needed to take my son to his archery lesson this morning and didn’t get up early enough (story of my life). I decided to use some of the almonds in a smoothie. Smoothies are my favorite quick breakfast. The chia seeds provide fiber, which makes the smoothie filling. I use whole strawberries without removing the tops. In place of strawberries, substitute any ripe fruit. Raspberries have even more fiber. Almonds blend more easily if they are soaked in water overnight. An alternative to soaking is to blanch the almonds in a pan containing a 1/2 inch of boiling water for 30 seconds, then drain. (You can pop off the skins for a smoother texture but less fibre). If you have easy access to unsweetened almond milk, you can substitute it for the water and almonds. I have not been able to find unsweetened almond milk in stores here (Holland). So I make my own sometimes. When I get up early enough. Be sure to check the carb content of your protein powder. Most of them are packed with sugar to make them palatable. But many low-carb powders have artificial sweeteners – not a great alternative. If you are being “pure,” substitute 1/4 cup egg whites for the protein powder. (The problem with egg whites is that too much will make the smoothie bitter). This recipe makes a great grab-n-go meal that provides fiber, protein, healthy fats, and fresh fruit for long-lasting satisfaction. In a blender, blend the almonds and water 2-3 minutes on high speed, until smooth. Then add the strawberries and blend again. Add the protein powder last and blend briefly. Protein powder tends to make smoothies very foamy, which I don’t like that much. But I think it’s better to have protein with the carbs. 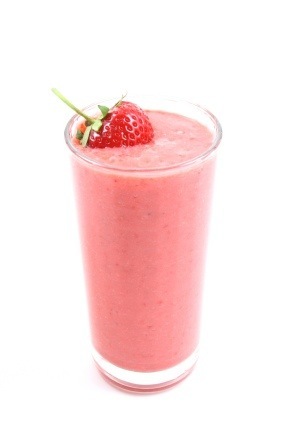 For a thicker smoothie, use less water or double the almonds (1/4 c). Posted in Recipes and tagged almond milk, almonds, chia, protein powder, smoothie. Bookmark the permalink.